What is trendy in the wedding industry currently? The wedding industry is always changing, but a few trends are taking center stage as of late. Lots of brides are choosing "minimalist" wedding themes. They are picking monotone color schemes or choosing accent pieces to liven up their weddings instead of a mixture of various colors. Natural wood, greens, and colorful florals seem popular with brides, followed but clusters of candles nestled in flowing greenery. A few stand-out pieces are all the decorations that some brides need, which is different than the décor style of weddings past. The monochromatic color scheme helps these pieces pop and creates that effortless yet romantic look. What kind of desserts are popular? Dessert tables, cutting cakes, etc.? This year, I have seen a lot of "naked" cakes with live floral accents. The naked look is achieved by using minimal icing where bits of cake peak through. 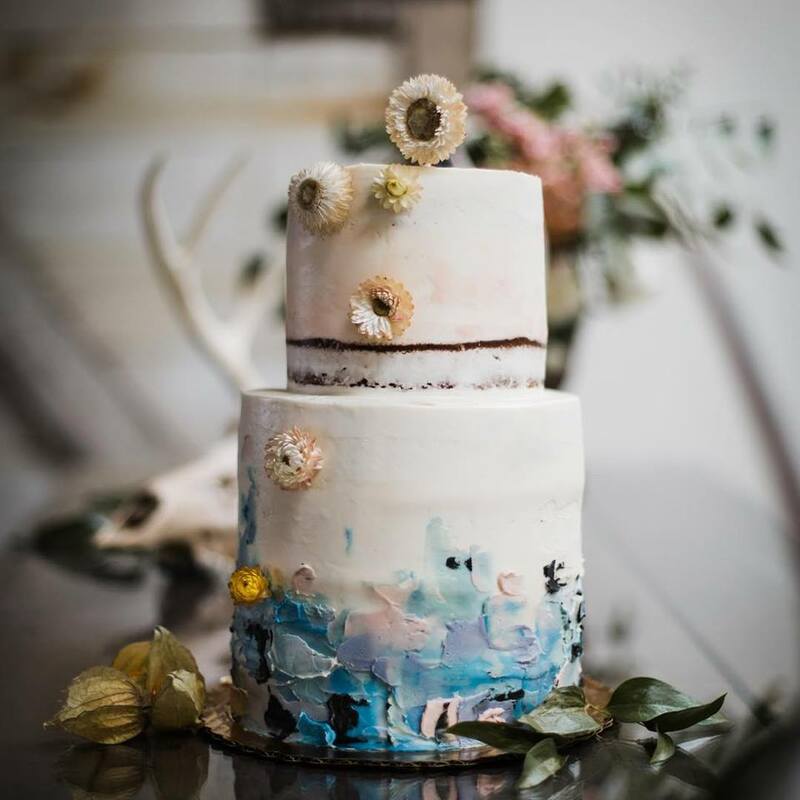 This style of cake fits into that minimalist theme that seems to be popular lately. In addition to that, brides are using dessert tables to give their guests more variety than just a cake. Items like mini cupcakes, cheesecake bites, brownie bars, and macarons have been popular with couples. What is the number one priority for brides? I think the number one priority for brides is the vision of their wedding space. Once a bride has the details of the space, she can really start putting together a vision for her theme. Once a theme is established, the bride can focus on bringing her dessert/cake options into reality, which is where we come in! My favorite part of working with brides is the creativity that I can be a part of. Some brides come in looking for ideas and suggestions and others know exactly what they want. Either way, I get to help narrow down a vision that helps each bride have a custom Hopscotch cake. All of our cakes are custom, and not one cake is a replica of another. What is your advice for every bride, regardless of budget? Figure out what will work best for your style as a couple. Desserts are an extension of the wedding itself. It's important to know what you, as a couple want. Being realistic is also key when shopping for dessert. There are more things that go into customizing an order than just style, flavor and look. Take your time and remember to have fun with it! Newer PostOur Team Has Grown!